Kevin Metsinger was born in Lawrence, KS on May 12, 1959. He was born again in the summer of 1976. Upon graduation from high school he went to school to be a mechanic, it is a trade that has proven to be a great tool in the ministry. While working as a mechanic God burdened his heart that He wanted more for Kevin’s life. He then enrolled in Bible college in 1979. He married his wife Lucinda (Cindi) in June of 1980. The Lord has blessed them with three sons. Jeremiah (wife Melissa, sons Noah, Haddon, Silas and daughter Paisley) is serving as pastor at South Knollwood Baptist Church in Topeka, KS. Benjamin (wife Kelsey, daughters Reagan, Avolea) heads up the RU program at his father-in-law’s church in Marshalltown, Iowa. Nathan (son Cody and daughter Madeline). The seven grandchildren are one of the greatest blessings that God has given them. He was called to preach after attending Bible College and working in Christian school and youth ministries. It was while God was calling several of the young men from his youth group to preach that God also called him. Kevin accepted the call as pastor of Shawnee Mission Baptist Temple on June 10, 1990. He has served on the Board of Directors at Heartland Baptist Bible College for 12 years. He has also served for 16 years as the chairman of the Mid-America Baptist Youth Camp, and several other committees and offices. Kevin joined the leadership team of the Kansas Men’s Retreat now known as the Recharge in 2004 with Bro. Britton and Bro. Sellers. Since then, leaders have changed but the desire is still the same. We strive to give men “in-your-face/life changing” PREACHING. Bill G. Marshall was born in Lawton, Oklahoma August 3, 1956. He was saved in April of 1984 from a life of drug and alcohol addiction. The LORD called him into evangelism in 1989 and he began to preach at every given opportunity. He and his wife, Pam, have been married since August 1978 and have two daughters, Emily and Sara. Pastor Marshall traveled in evangelism for 16 years before accepting the pastorate at (Bible Baptist Temple), now Riverside Baptist Church in January of 2008. The Lord has done great things in the past 6 years, including allowing them to purchase and remodel the building they now meet in on Mitchell Ave. The church is growing and very excited about what the Lord is allowing them to accomplish for His glory. 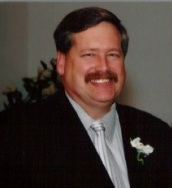 In 2009 Pastor Marshall came aboard as a co-host of the Baptist Men’s Recharge. He considers it a great privilege to be able to be a part of a men’s meeting that’s being used so mightily by God. The men at Riverside Baptist Church enjoy working together with the men of Shawnee Mission Baptist Temple as servants of the Lord. Pastor Marshall is a Bible preacher and has a holy hatred for sin. He has a sincere desire to see those that are lost repent and trust Jesus Christ as their personal Saviour. He believes that the world needs to see strong Christians living the victorious life that God has for them. He knows that the preaching and teaching of God’s Word will give direction toward that life. He has a desire to lead them that way.